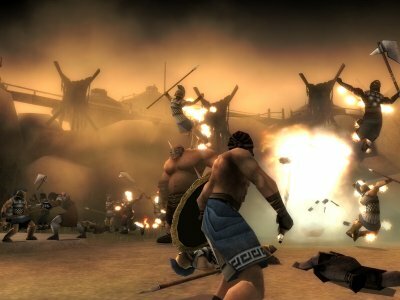 In the epic style of "Gladiator" and "Braveheart" you, as a bloodthirsty Spartan warrior, lead the charge with no fear or remorse headlong into massive cinematic battles where your only options are victory or death. 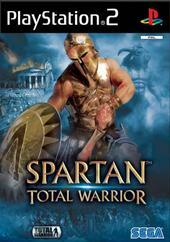 Developed by The Creative Assembly, the team behind the award-winning Total War PC series, Spartan drops all pretensions of being a high-minded educational strategy game and goes for the jugular with buckets of blood and a simple to pick up combat system that relies heavily on defense. Spartan: Total Warrior is an action/strategy game that gives players a multitude of assignments and additional objectives that must be completed during the battle. First the game tells you to protect the king – then it tells you to stop the gate from being breached. This is a two-for-one scenario. The mission cannot be completed unless the king and the gate are still standing by the time all the Romans have been taken out. Although the screenshots may look like a traditional hack 'n' slash game, Spartan is in actual fact a strategic fighter that gamers must use wit and brawn to successfully finish. The control system of Spartan is rather intuitive so that anyone can pick up a pad and dive in but the emphasis on defense in Spartan makes things quite challenging and really exciting when you get things right. The Spartan can use his shield to block, counter and bash foes back for a combo set up or down for a killing blow. In missions where he’s shield-less, you’ll need to use whichever weapon he’s got equipped to block and counter. I can’t stress the emphasis on blocking here enough as the AI in Spartan: Total Warrior is full of enemies who block, flip or roll out of the way, or dodge and counter blows with ease. Even on Easy mode, if you just jump into a crowd of enemies and start swinging, you’ll be cut down within seconds. Fortunately, Spartan can unleash a number of special attacks that consume magic orbs he collects from defeated enemies or prayer shrines scattered around the levels. There are also healing shrines, but you’ll need to make sure any nearby foes are deceased before you kneel. The action doesn’t pause during these brief moments, so you’ll get hacked in the back while you’re trying to get that health back. Visually, Spartan: Total Warrior looks mostly great. The character models are definitely styled after Grecian art and there’s a nice touch of comic-book artistry in the angular figures. There are a few pointy heads and other elements that more picky purists will flip out over, but I "got" the design decision as soon as i saw the first set of screenshots over a year ago. The Spartan actually changes equipment and even grows a beard as the game progresses. The great thing is that the animation is quite smooth and the frame rate doesn’t dip all that much below 60 fps except on rare occasions. The musical score for Spartan: Total Warrior is an interesting blend of orchestral theme music with some modern instrumental concessions. It’s not as jarring as the hard rock in games like the Kingdom Under Fire or Dynasty Warriors series, but like these titles, it’s an acquired taste if you were expecting some sort of all-orchestral soundtrack. In conclusion, Spartan: Total Warrior delivers the goods if you’re looking for a solid chunk of challenging action from start to finish. Sega and The Creative Assembly have crafted a great take on the traditional mythological tales of old and it’ll be even more interesting to see where they take the Total Warrior line in the future.